Maleficent was the one fairy tale villain that I was truly terrified of. I watched Disney's Sleeping Beauty for the first time when I was about five or six, and Although I loved the movie, Maleficent gave me nightmares. To this day, she's still one of my favorite Disney villains. 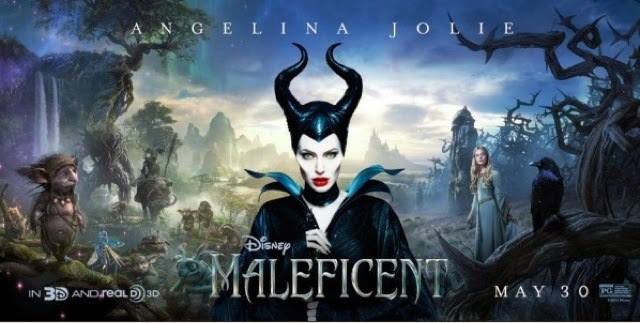 When I first heard that Disney was making a movie about the untold story of Maleficent, I was reluctant to watch it. I thought I already knew what it was going to be about. I thought it would be like Wicked: a story that showed Maleficent was no villain, just a tragically misunderstood hero. I figured her story would win me over and I'd end up rooting for her. I figured the movie would end with me feeling sad and frustrated that the fairy tale turned out so badly for her, just like Elphaba in Wicked. ...and now you might be able to guess the reason. Seriously, though, why do men have to be so greedy and ambitious and war-like? Girls don't need a prince to save them! Given lesson #2 above, I think the world would truly be better if girls did run the world. I might be giving away a bit of a plot spoiler here, but if this movie is any indication, I think Disney agrees with me! The movie doesn't excuse Maleficent for the awful things she did in Sleeping Beauty. But it definitely shows a different side to her. Maleficent was definitely no cookie cutter fairy tale, and that's why I loved it (again, another similarity with Frozen!). The movie was a visual and emotional treat -- it was such a pleasure to see the beautiful scenery and special effects unfold in front of my eyes (not to mention all the beautiful people like little Vivienne Jolie-Pitt, Elle Fanning, and Angelina Jolie! ), and so nice to watch a movie that made me feel all the warm fuzzies at the end.There's a lot of dark imagery that can be intense for young kids, but if they can make it to the end, I can promise a truly happily-ever-after fairy tale ending! PS: you can skip the added cost of seeing Maleficent in 3D. I don't think it added anything to the visual experience. Disclaimer: I was invited to an advanced press screening of Maleficent in order to facilitate this review. Summer is almost here, and for 90% of the country, it can't come soon enough! The country has suffered through a long, hard, winter, and people can't wait to bask in the sun and head outdoors. With vacation time looming, no doubt you're already planning lots of road trips to amusement parks, the beach, the mountains, or your favorite lake. I am planning lots of day trips to nearby museums, attractions, lakes, and beaches. We will also be visiting the UK, and I'm going to be driving to London for the first time ever, on the "wrong" side of the road! Finally, when Alfie joins us, we'll be going on a weeklong road trip to Scotland. I can't wait! 1. Wash your car at a professional car wash. Winter months can be especially hard on your vehicle and washing your car is an easy first step to making your car feel new again. Using a professional car wash is a great way to protect the environment. According to the International Carwash Association, WaterSavers professional car washes use an average of 40 gallons of water or less per car while recycling and filtering their water to prevent harmful chemicals from going into our rivers and streams. Professional car washes also remove salt from the undercarriage of your vehicle, which is a must after a long winter. By comparison, the average home washing machine uses 41 gallons per cycle, and a garden hose uses 63 gallons of water in just five minutes. You can learn more, and find a WaterSavers wash at Washwithwatersavers.com. 2. Give the inside a deep clean. Winter’s elements are hard on the outside of your car, but many people forget the abuse the vehicle’s interior takes as well. Think of how many times you’ve crawled into your vehicle with dirty, snowy feet and you can begin to understand why cleaning the inside is necessary. Apply some baking soda and a rubber sponge to your floor mats for an environmentally friendly and efficient clean. Then, wipe down interior surfaces with a microfiber cloth and vacuum the fabric and floor to remove dirt, sand, salt and dust. · Gap Stick: A versatile auto accessory to help access the hard-to-reach areas of a vehicle. Designed with a strong magnetic hook, the gap stick can pick up a key ring, jewelry or anything else that has slipped between the seat and the center console. · Phone Caddy: A plastic phone holder that clips to air vents in any vehicle to keep your phone in view for GPS usage and close to charging outlets. · Auto Trash Bag: A sleekly designed bag with a bottom zippered compartment for extra garage bags or hand wipes. 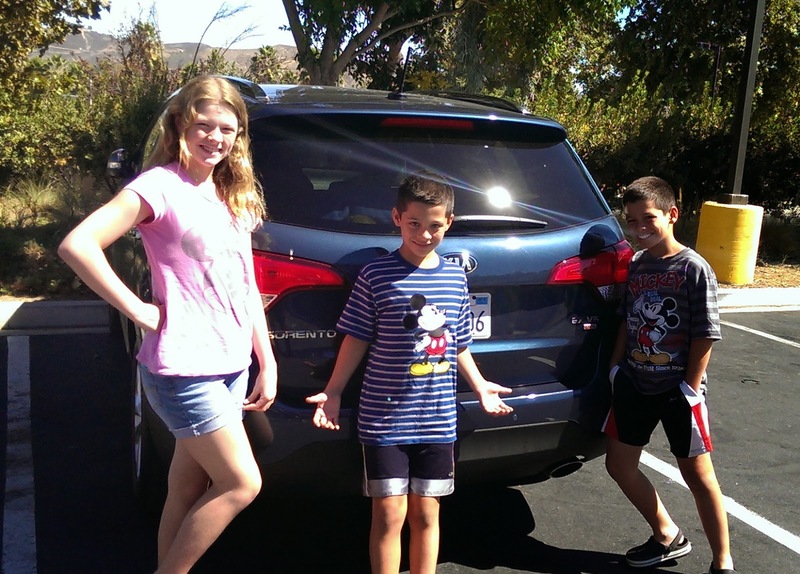 Leave a comment on this post and share a suggestion for getting your vehicle ready for summer road trips -- or share a description of the road trip you are planning for this summer. This giveaway ends at 11:59PM PST on June 15, 2014; I will draw a winner at random, on June 16 and post their name after they confirm acceptance. Continental US residents only. For additional giveaway rules, click here. Disclosure: Thanks to the International Carwash Association for providing the giveaway prize pack as well as a second prize pack for me. WaterSaver tips (in italics) is provided by the International Carwash Association. The views and opinions expressed here are my own. Please remind your readers that you are a Sprint Ambassador and that you will be sharing your experiences testing various Sprint devices and service options over the course of the year. One of the modern conveniences we miss most in our van is Bluetooth connectivity. It has a cd and DVD player, but all of our music resides on our phones, or online, in the Cloud, so we can't fully enjoy our music library on the road! We have tried using wireless Bluetooth speakers in the car, but the sound produced can be somewhat crackly and tinny, especially in a car. 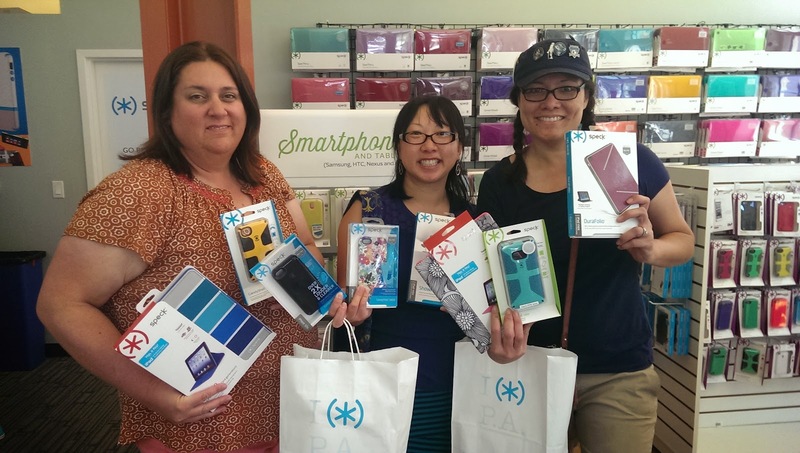 We love listening to music on road trips, so when the opportunity to try out the new HTC One (M8) Harman/Kardon Edition, we welcomed it with open arms. 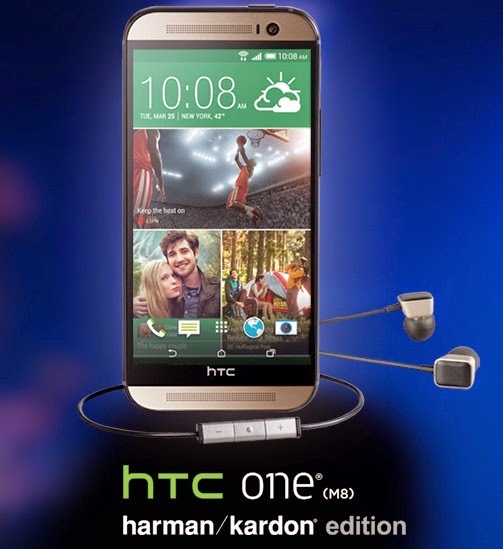 With revolutionary technology that restores all types of compressed digital music and provides a more life-like headphone listening experience, the beautifully crafted all-metal HTC One (M8) Harman/Kardon Edition with superior design inside and out provides you with a music experience unlike any other. To be perfectly honest, when I first heard that Sprint had this phone available, I didn't think much about it -- but that's because I'm completely ignorant about audio technology. Alfie recognized the Harman/Kardon name immediately and declared I must be living under a rock to not know that Harman/Kardon is one of the premier brands in home audio and car audio. After trying out the HTC One (M8) Harman/Kardon Sprint smartphone, I can see why the Harman/Kardon name is so respected -- the sound is wonderful! I enjoy listening to music while running, blogging, folding laundry, driving in the car, so I've been using it quite a lot. The phone features patented Clari-Fi™ technology, which analyzes digital audio files in real time and restores what was lost in compression. The phone also comes with special Harman/Kardon earbuds with LiveStage™ feature that will leave you swearing you're listening to music at a live concert. 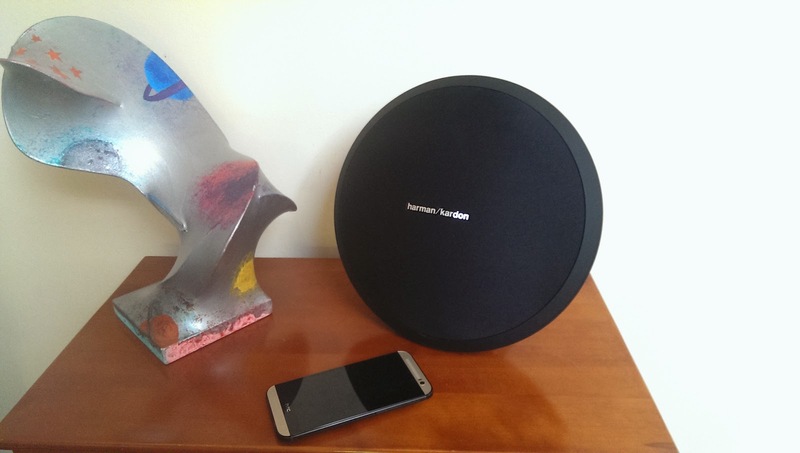 Great audio isn't the only great feature of the the HTC One (M8) Harman/Kardon Edition. This phone is slightly larger than my HTC One (first generation), but just as slim. The phone has an elegant metal detailing which was not available with my HTC One or with other models. It has a 5-inch Full HD screen and a great camera that captures bright, clear photos. What's more, if you are with Sprint, your HRC One (M8) Harman/Kardon Edition phone comes with access to Spotify's catalogue of more than 20 million songs! As part of our review, Sprint also sent us the Harman/Kardon Onyx Studio wireless speakers. It works brilliantly with the HTC One (M8) Harman/Kardon edition phone! It's amazing that such wonderful sounds can come from such a small speaker -- we have numerous Bluetooth wireless speakers, and none of them can match the sound quality to the Onyx Studio. No hissing, no crackles, just sweet, sweet music. No doubt the fact that Harman/Kardon is responsible for the audio parts on both the phone and the speaker has a lot to do with it! You can only connect 1 speaker to your device via Bluetooth, but the sound quality is so good, and our living room is quite small, so it doesn't feel like we're giving anything up. We've been saving up to buy a Bluetooth wireless sound system that can hook up multiple speakers, but after enjoying the music streaming from our new HK Onyx Studio, I'm not sure we need it. The Onyx Studio is portable, so I can't wait for our next road trip so we can take both the phone and the speaker in our van! Disclosure: I participated in a campaign on behalf of Mom Central Consulting (#MC) for Sprint. I received a product sample to facilitate my review and to thank me for participating. Product information (in italics) is provided by Mom Central. The views and opinions expressed here are my own. 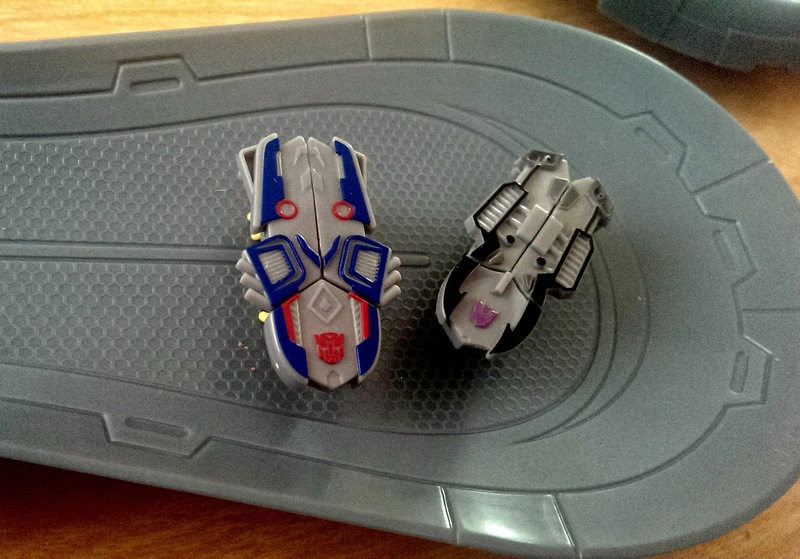 Yesterday I blogged about how HEXBUG is celebrating the new Transformer movie with some cool Transformer-themed Nano TRANSFORMERS. Those lifelike, buglike creatures with Transformer armor are cool indeed -- but I've saved the best for today! HEXBUG is also releasing a special Transformers version of their popular Warrior battling robots in Fall 2014 -- and we were able to get a sneak peek! The photo below shows one of the new HEXBUG Warrior TRANSFORMERS -- Optimus Prime (there will be six varieties: Optimus Prime, Galvatron, Lockdown, Bumblebee, Crosshairs and Drift). Like the regular Warrior bots, these come with detachable pieces of armor and weapons that you can mix and match with other Warrior TRANSFORMERS, as well as with regular WARRIORS. My boys love mixing and matching pieces to create unique armor and weapon combinations! 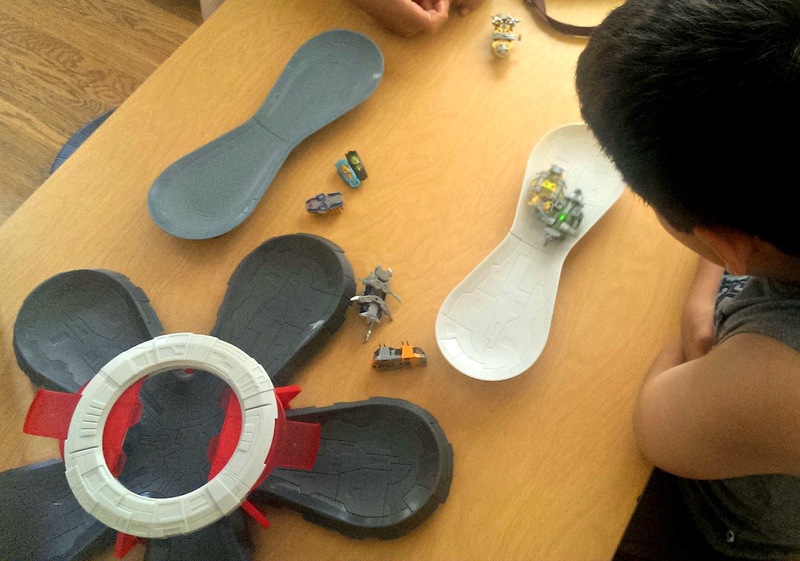 Just like the original HEXBUG Warriors, the Warrior TRANSFORMERS are meant to do battle! You can pit one Warrior against another in Training Mode, so you can do some test runs. When you're ready for battle, switch over to Match Mode and have the Warriors crash against each other until one of them wins. Each Warrior has a Damage Indicator Light which indicates its health level. When one Warrior collides against another, one of them suffers a hit when its Shock Sensor registers. The Damage Indicator Light will change colors from green to red as the Warrior sustains more hits, and if its health level reaches zero, it will stop moving. The last Warrior left standing wins! Warriors can battle on any surface, but for more fun, you can get a Battle Arena, which includes 2 Battle Arena pieces that snap together. It's nice to restrict the Warriors to an enclosed area so they don't scurry off, and you can even watch the battle on a table instead of on the floor. For even more fun, collect lots of HEXBUG Warriors TRANSFORMERS and pit them all against each other in the ultimate battleground: the HEXBUG Warriors TRANSFORMERS Battle Stadium! The Battle Stadium has five battle "wings" that lock together and a ceiling with a retractable floor, so you can view your Warriors battling, or drop a new Warrior into the fray! These Warrior TRANSFORMERS are a lot of fun, and they're good for hours and hours of play. It's the perfect toy to get summer started for Transformers fans and for HEXBUG fans! HEXBUG Warriors are tiny, collectible, micro robots that use the physics of vibration to propel forward and battle with competitors with interchangeable weapons and armor. 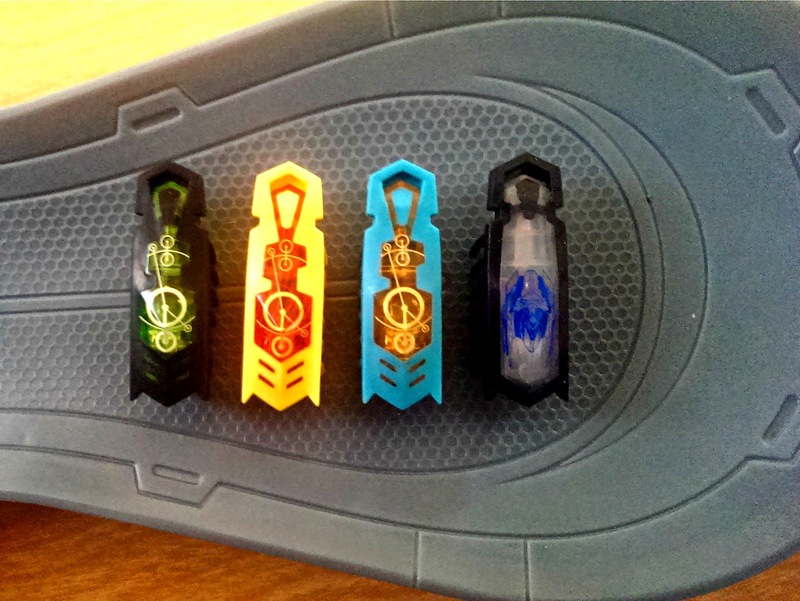 Now the series brings you more action than ever with the HEXBUG Warriors TRANSFORMERS! HEXBUG warriors TRANSFORMERS are the ultimate battling bots in the age old conflict between AUTOBOT and DECEPTICON. The HEXBUG Warriors TRANSFORMERS collection includes 6 individual models with customizable armor and weapons that emerge from their backs and transform for engaging battle action. Outfit your HEXBUG Warriors TRANSFORMERS with a strategic combination of mechanical weapons and armor to outmaneuver rivals, and battle to control the fate of your fleet! These battery powered robots have intelligent battle sensors inside that register damage as the fight rages on. Swap out the armor combinations for epic TRANSFORMERS action! BUMBLEBEE, CROSSHAIRS, DRIFT, GALVATRON, LOCKDOWN and OPTIMUS PRIME. Two button cell batteries AG13 (LR44) are included with each Warrior. HEXBUG Warriors TRANSFORMERS is compliant with CPSIA standards. Ages: 6 years and up. Available Fall 2014 at major retailers nationwide or at http://www.hexbug.com. Disclosure: I received a product sample to facilitate my review, but have not been paid to review the product or give my opinions. Product information (in italics) is provided by HEXBUG The views and opinions expressed here are my own. Who's excited for the new Tranformers movie? The fourth film in the series -- "Transformers: Age of Extinction" -- comes out in theaters on June 27! My brothers were obsessed with Transformers when they were little, so I've followed the adventures of the Autobots and the Decepticons for years. The special effects of the past 3 movies have been amazing (and we all loved the Transformers ride at Universal Studios Orlando! ), so we're all looking forward to this film. Given that the last Transformers film, 2011's "Transformers: Dark of the Moon" made more than $1.1 billion worldwide, this one promises to be a blockbuster! Naturally, there are all kinds of Transformers merchandise tie-ins like costumes, figurines, transforming robots, and other toys. 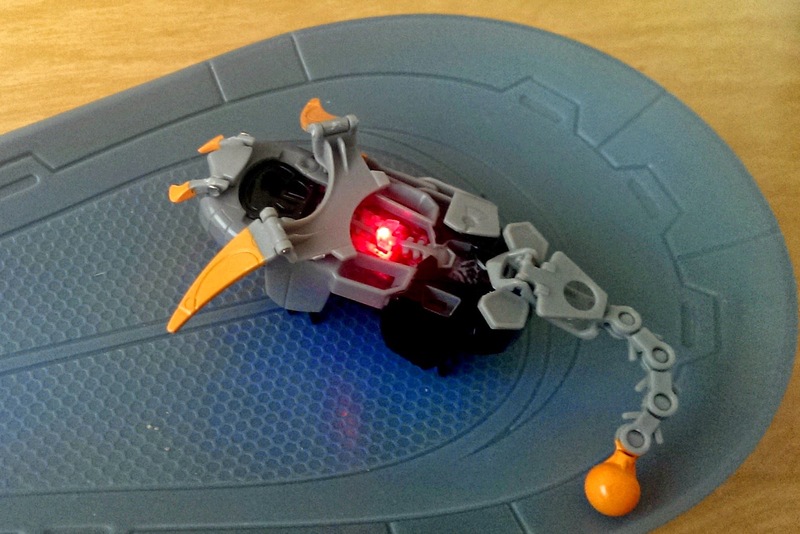 I'm sure one of the most unique will be HEXBUG's special Transformers-themed robotic bugs. HEXBUG Nano Transformers are identical in shape and size to HEXBUG's popular Nano bugs -- in the photo below, the bug on the far right is a Transformer Nano, and the other three are regular Nanos. Like all Nanos, HEXBUG Nano Transformers scuttle in random directions, they bump into things, they switch directions, they flip over and back again... in short, they behave like real bugs! But unlike the regular Nano bugs, these Nano Transformers come with clip-on armors designed to resemble Transformer robots. The armor clips securely to the top of the bug. What's more, the armor flips open to look like winged creatures -- they transform, just like the Transformers! How cool is that? 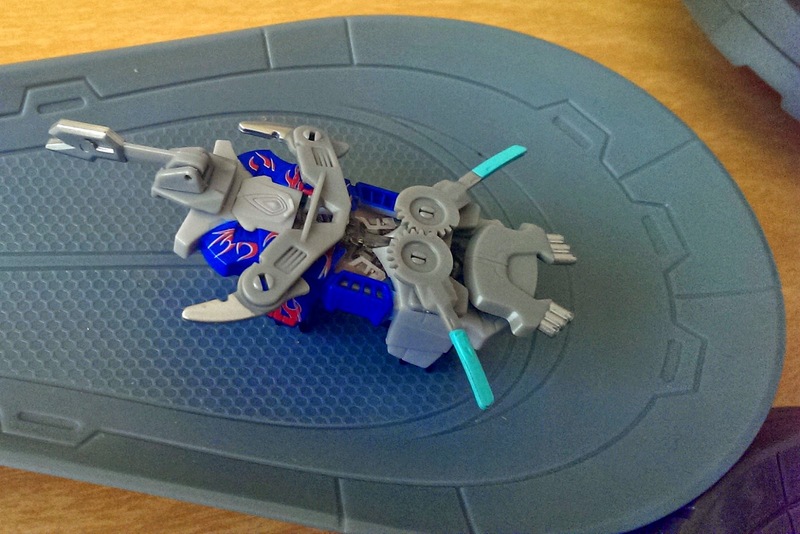 You can also clip the Transformers armor onto regular HEXBUG Nanos. These are perfect collectibles for anyone who loves the Transformers, and anyone who loves HEXBUG! HEXBUG Nano, a tiny, energetic micro robotic bug that uses the physics of vibration to skitter along and explore its environment is back and ready for battle! HEXBUG Nano TRANSFORMERS are the ultimaterobotic drones in the age-old conflict between AUTOBOT and DECEPTICON robots. Each HEXBUG Nano TRANSFORMERS comes with transformable clip-on armor backpacks inspired by popular TRANSFORMERS characters including OPTIMUS PRIME and BUMBLEBEE. Swap out the armor combinations for epic TRANSFORMERS action! Powered by a tiny motor, and 12 fixed, angular legs, the HEXBUG Nano explores its environment, moving with life-like bug behavior. When coming into contact with an object in its path, the energetic insect will switch directions and scurry away on a new path due to its persistent random behavior. BUMBLEBEE, CROSSHAIRS, DRIFT, GALVATRON, LOCKDOWN and OPTIMUS PRIME. One button cell batteries AG13 (LR44) is included with each Nano. This product is compliant with CPSIA standards. Ages: 3 years and up. Available Fall 2014 at major retailers nationwide or at http://www.hexbug.com. Disclosure:I received a product sample to facilitate my review, but have not been paid to review the product or give my opinions. Product information (in italics) is provided by HEXBUG The views and opinions expressed here are my own. 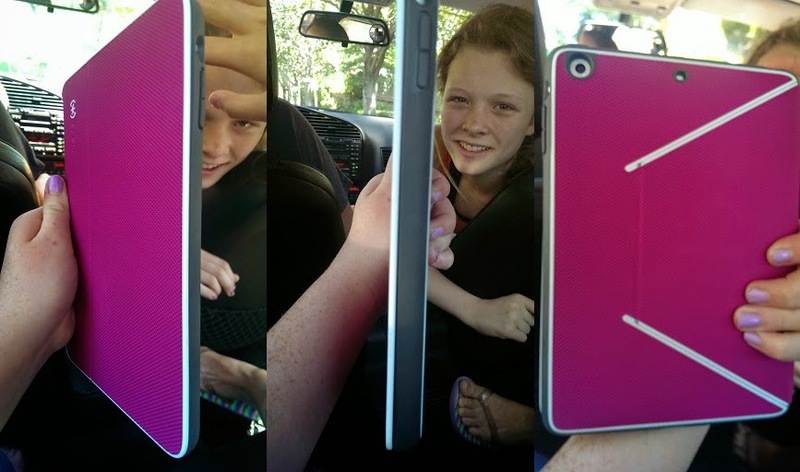 When we first got The Pea her iPad, I bought her a Speck case to go with it. The case is made of pink, military grade plastic, with a fabric cover in a black and white floral print. Three years later the white parts are almost grey, and the plastic clasp on the cover no longer works -- but the iPad doesn't have a scratch or crack on it! 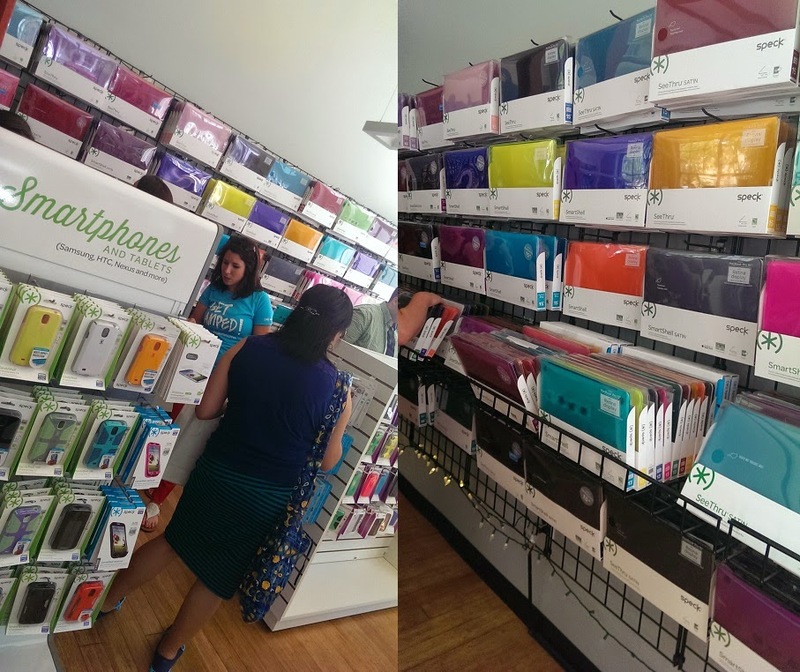 The Pea loves that Speck case, and despite my repeated offers to buy her a new one, she has refused to give her old one up -- until Speck invited me to check out their Palo Alto retail store, and I found the exact same case in the store! If you're an Apple devotee, the possibilities are almost endless. Not only do they have solid colors, they also have adorable designs like their floral patterned Candy Shell Inked cases for the iPhone 5s/5. Also new this season is their Candy Shell Amped case, which has grooves on the underside of the case to redirect sound from the iPhone's speakers to your ear, for better sound quality. Here's another winner I got to take home: a DuraFolio cover for the iPad mini. The Pea and her friends love the striking fuschia color and slim fit (hey, it's an iPad mini, the whole point is not to have bulk!). I love the military grade protection -- you can literally throw your device on the floor and it won't crack (the Speck representatives at the blogger event were doing it but I just can't bring myself to try it!). Another great product for the iPad mini is Speck's ShowFolio case for the iPad mini. It has hooks that clip on to your car's front seat headrest, so the kids can watch movies on road trips. 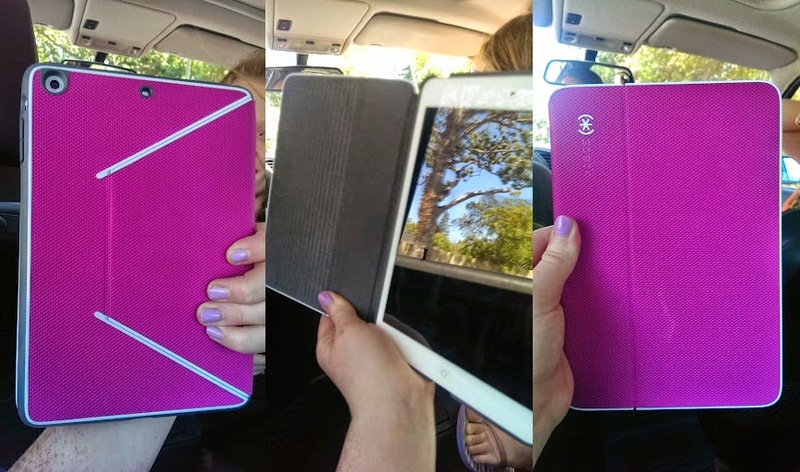 The hooks swivel back into the case, so when you're not in the car, it functions as a normal case that flips to prop up your iPad mini. How I wish Speck made these for regular-sized iPads! We're insanely lucky to have the Speck store literally a 10-minute walk from home, but fortunately for everyone else, you can find all of Speck's products online. 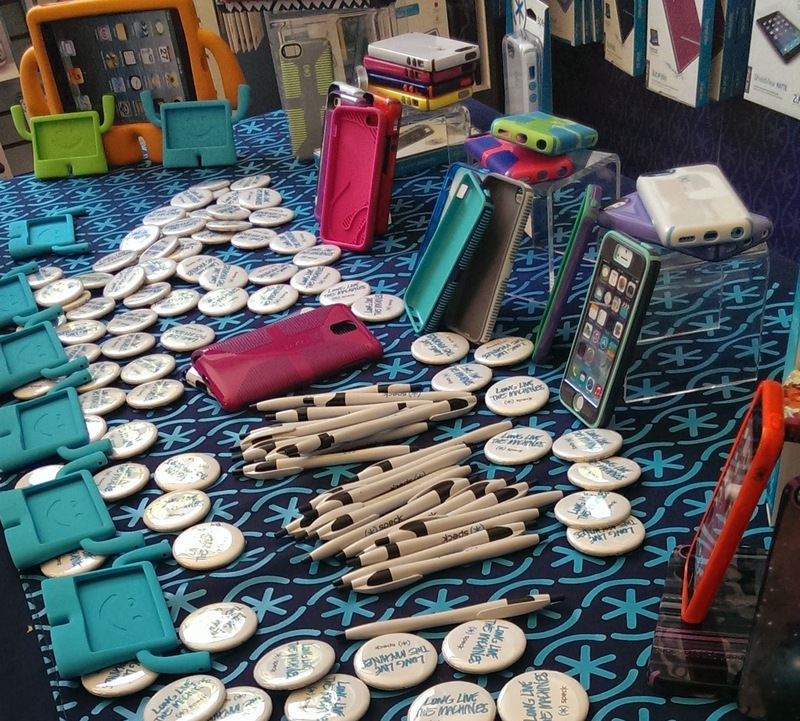 With so many cute options, the only thing harder than choosing a case for your device is the material the case is made of! 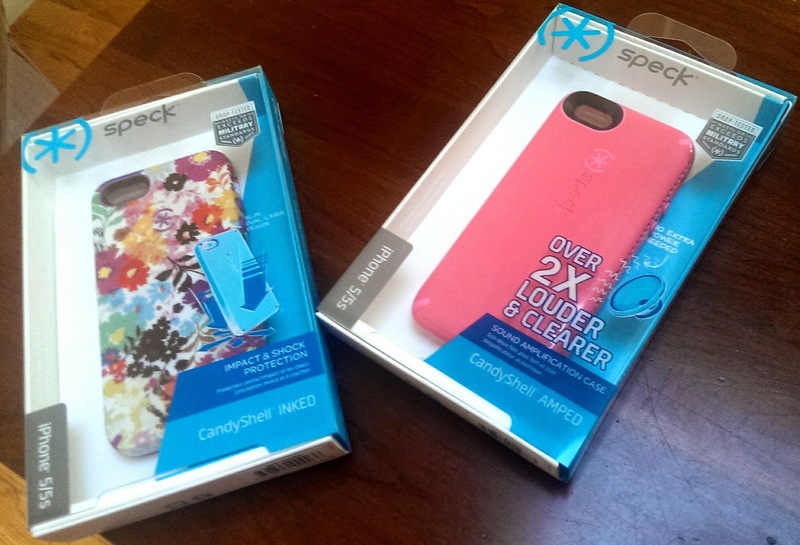 Disclosure: I was invited by Speck to attend a blogging event and received product samples to review. The views and opinions expressed here are my own. The schoolyear is almost at an end, and we have a ton of end-of-year parties coming up: class picnics, 5th grade graduation, PTA, and soccer club! I want to bake some nice desserts but really don't have the time, so I'm turning to Duncan Hines for the easiest, prettiest cakes ever! I received samples of their Signature Pink Velvet, Signature Blue Velvet, and Limited Edition Spring Velvet Cake mixes, and couldn't wait to try them out, but The Pea got to them first. She was ecstatic when she saw the boxes! Usually, in order to bake a multicolored cake, you have to mix up lots of batter, divide it up, and color each portion. I only have one mixer, so that's a lot of bowls and spatulas to wash! 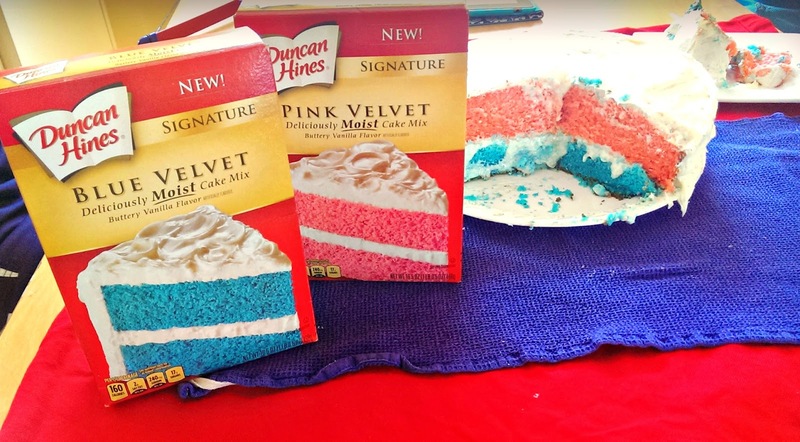 With these Duncan Hines cakes, you just bake each color in a separate pan (or pour half of each color into the same pan, and swirl a knife through the batter for a swirled effect). If you don't want a big cake, the Spring Velvet cake mix is even better -- one box contains both pink velvet and yellow velvet cake mix! This was The Pea's very first attempt at a layer cake. I didn't help her at all, and I think she did a great job! Even though it definitely looks a beginner's cake, the colors make it look so pretty :) And it certainly didn't taste like a beginner's cake! It was really moist and fluffy, tastewise, the cake did not have that hint of chocolate that I was expecting (since I assumed it would be like red velvet cake, just blue/pink/yellow colored). Still, the cake tasted great, more like a yellow cake. This would be great for bundt cakes, sheet pudding cakes, cake pops, or cupcakes. I think I know what I'll be making for all those parties next week! The Pea has fair skin, so we're usually pretty vigilant about sun safety, but there are times when we have slipped up. I'll never forget the time I completely forgot to lather her up with sunscreen for a neighborhood parade, and she ended up with a nasty sunburn. Think it's no big deal? 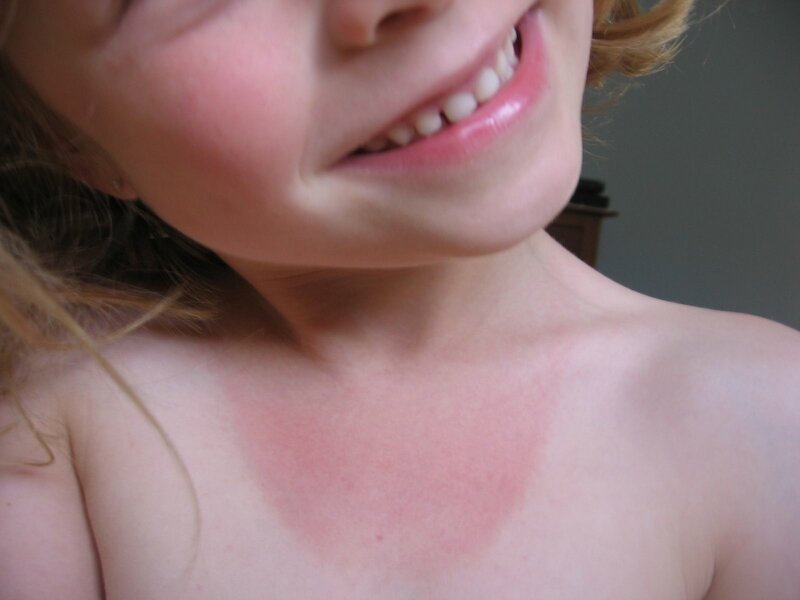 Studies have shown that suffering one or more blistering sunburns in childhood or adolescence more than doubles a person’s chances of developing potentially-deadly melanoma later in life. I know it's not easy to remember to apply sunscreen on your child day in and day out, but the benefits are so worth the effort. Here are three tips that can make it a bit easier to keep your child safe in the sun. 1) Invest in sun-protective clothing (clothing made of fabric with build-in SPF factor) that your child can wear every day. 2) Get into the habit of putting a hat on your children from an early age. 3) Keep sunscreen in your entry hallway, your purse, and your car. And speaking of sunscreen, don't forget to read the label on the sunscreen you put on your kids! You can't be too careful about the chemicals you put on your child's skin, especially your baby's skin. Babyganics, the leading manufacturer of naturally safe and effective products for a “baby-safe world,” has introduced a new product to their sunscreen line: Mineral-Based Sunscreen lotion (50+SPF). I was given a sample to review and I think it's great! It doesn't smell like it's full of fragrance or nasty chemicals (and it isn't). Like all mineral-based sunscreens, it's pretty thick, so you need to rub it in well to get it to absorb into the skin (otherwise your baby ends up with lots of white patches! ), but it's definitely not as stubborn as many mineral-based sunscreens out there. It feels more like a lotion that a paste, so you're more likely to apply it regularly. And it's good to know that Babyganics does not contain any PABA, Parabens, or Phthalates! Contains Babyganics’ exclusive NeoNourish Seed Oil Blend that nurtures and supports baby’s skin. Today is Mother's Day! It has been a busy few weeks for me, attending blog events, closing out my duties as PTA president, starting next year's duties as PTA VP of communications, navigating the end-of-the-schoolyear/soccer tournament/dance recital/piano recital craziness, and starting a new job! Like many of you moms out there, I barely have a moment to myself, so one of the nicest treats I can get as a mom is a few kid-free hours today! Today is one day I'm not going to worry about whether the kids have practiced their piano or had too much screen time :) The last thing I want to do is yell and scold. After all, having kids is what made me a mother, so I wouldn't be the guest of honor today if it wasn't for my kids! To celebrate moms AND kids, I'm giving away a gift card from one of my favorite kid-friendly brands, Leapfrog. One lucky Bonggamom Finds reader will receive a $20 Leapfrog Digital Download Card, which can be used to download your choice of hundreds of learning games, eBooks, audio books, apps, and more from Leapfrog.com. Hopefully it will free up a bit of time for you and treat your kids to some fun and learning at the same time! Leave a comment on this post and tell me how you plan to spend Mother's Day. This giveaway ends at 11:59PM PST on May 18, 2014; I will draw a winner at random, on May 20 and post their name after they confirm acceptance. Continental US residents only. For additional giveaway rules, click here. Disclosure: Leapfrog gave me a download card as a thank-you for a past post, for my personal use. I'm choosing to share the love and give it away. The views and opinions expressed here are my own. As parents, we want to raise our children with self confidence and the belief that they can be anything they want to be when they grow up. Sadly, the struggle to attract young women into STEM (science, technology, engineering and math) fields continues. If your daughter loves math and science, there's no time like the present to let them know that math and science are cool -- and if you have a son, there's no time like the present to let them know that girls can be just as good as boys! 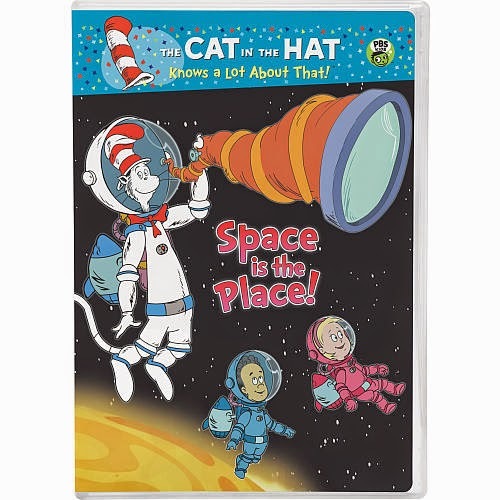 You can nurture their interest from the start by introducing them to shows like Sid the Science Kid and the Octonauts, and even the Cat in the Hat. 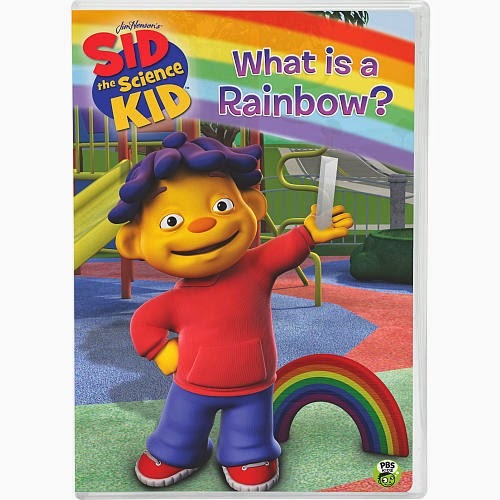 These shows spark kids' interest in the natural world because the characters they love are curious about how the world works! 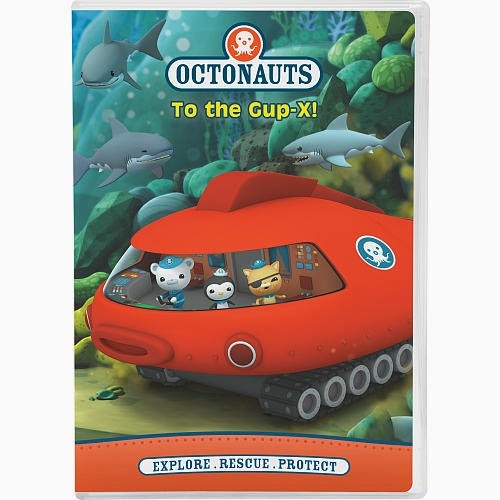 Below are 3 great DVD's from NCircle Entertainment to check out -- and NCircle Entertainment will be sending all 3 DVDs to one lucky Bonggamom Finds reader! Leave a comment on this post and share a suggestion for nurturing kids' interest in science and math. This giveaway ends at 11:59PM PST on May 20, 2014; I will draw a winner at random, on May 21 and post their name after they confirm acceptance. Continental US residents only. For additional giveaway rules, click here. Disclosure: I received a product sample to facilitate my review, but have not been paid to review the product or give my opinions. Prize package and product information (in italics) are provided by NCircle Entertainment. The views and opinions expressed here are my own. Mother's Day is this weekend! It has been a busy few weeks for me, attending blog events, closing out my duties as PTA president, starting next year's duties as PTA VP of communications, navigating the end-of-the-schoolyear/soccer tournament/dance recital/piano recital craziness, and starting a new job! Like most of you moms out there, I've barely had time to catch a breath, so I'm looking forward to being pampered this weekend. This giveaway ends at 11:59PM PST on May 16, 2014; I will draw a winner at random, on May 17 and post their name after they confirm acceptance. Continental US residents only. For additional giveaway rules, click here. Disclosure: I incurred all expenses associated with this giveaway. The views and opinions expressed here are my own.